As most flowers come in from Holland, we will keep you informed on UK import duties post Brexit, as this may affect the prices of your wedding or event flowers. Deposits (for order/event confirmation) and booking fees are non-refundable. Note: Significant negative order changes or requirements will incur penalty fees. 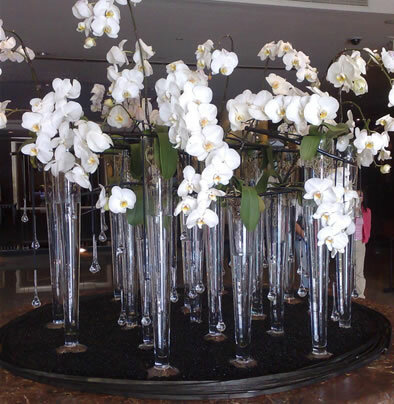 Equipment hired (vases, plinths, candelabras, chair covers etc) remain the property of Blooms for Business at all times and must not be removed from the venue. Any damaged or missing items will be charged for. Large bay and olive ‘lollipop’ trees £85 each. Final numbers for table arrangements/vases must be given in writing at least 14 days before the wedding or event – After this time it may be possible to add to, but not subtract from the order. Payment terms are 30 days from event date for corporate events and 14 days before wedding date. Interest will be payable on all outstanding amounts at the rate of 2% per day. The client will be liable for all legal charges incurred by Blooms for Business in the recovery of all overdue amounts, equipment and/or goods. No wedding or event is booked until the deposit/booking fee has been paid. Quotes are valid for 30 days. Once the booking fee has been paid then the prices and dates are secure unless stated otherwise. Images sent out by us of arrangements/bouquets/vases etc are to give ideas only; each event/wedding is unique and budgets vary. All images are copyright. We are more than happy to make ‘mock-up’ vases and bouquets- there is a charge for them. Please note first consultations are free (up to 1 hour), there may be a discretionary charge for others. 48 Hours notice is needed to cancel consultations or a charge may be applied. Wedding/event cancelled 9 months prior to the date, 25% of total order is payable. 6 to 9 months prior to the date, 50% of order is payable (less booking fee). Within 3 months of the date, full amount is payable. Website statistics are produced and online advertising tracked – allowing us to record visitor numbers, number of pages viewed, pages visited and referral source. These statistics do not record any personal data. This data simply helps us to administer the website and manage our online advertising.